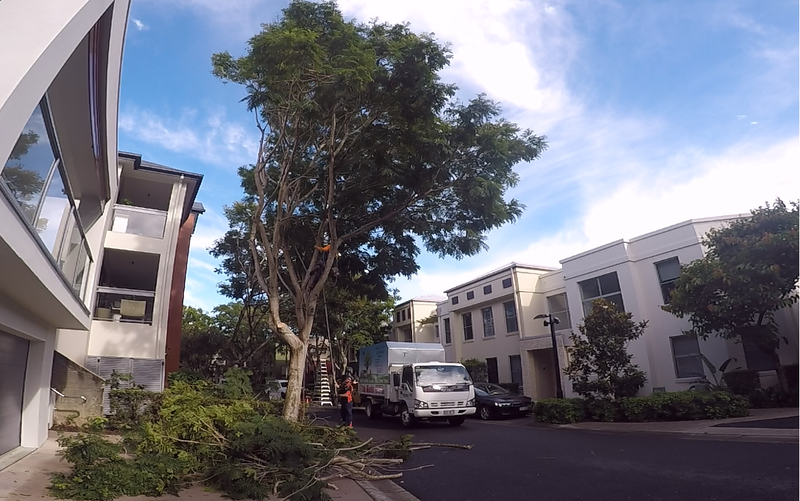 This week's top job goes to our tree pruning and tree removal work for a body corporate in Emerald Lakes. 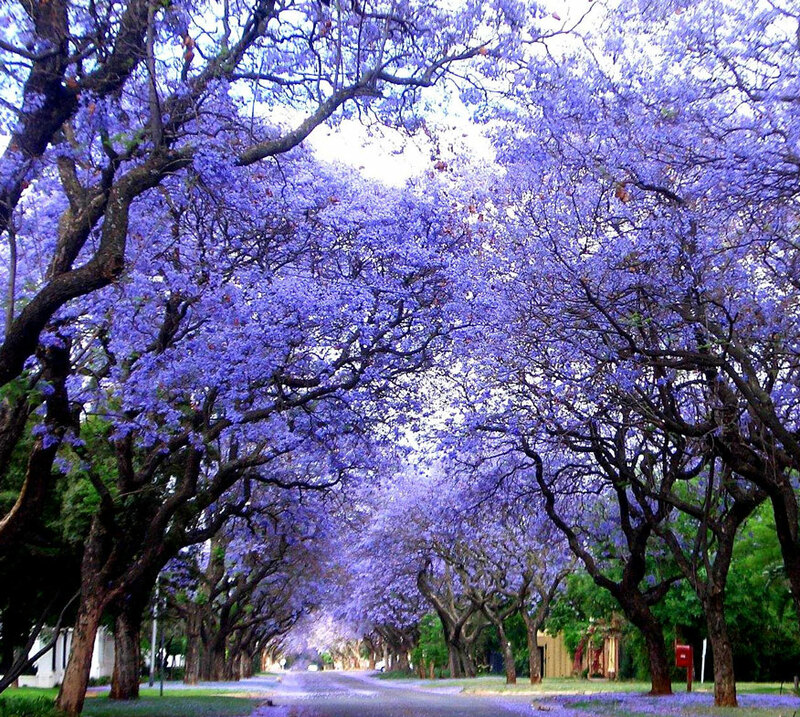 The primary concern was the thirteen street trees which had grown into and over the surrounding homes. These problem trees were causing damage to gutters and providing a pathway for pests to invade the homes, as well as reducing the passage of natural light into the homes. Our Gold Coast Arborists were called in to prune the branches away from the buildings and conduct a canopy lift on the roadside. The goal of this roadside tree pruning was to ensure all residential vehicles and delivery trucks could pass easily through the street without causing damage to vehicles or the trees. These large leopard trees were probably not the best choice of tree to plant so close to homes, as they have now grown far larger than the body corporate first expected. This is a reminder to all of us to be careful in choosing the right plant for every location, ensuring we understand the growing characteristics and anticipated mature height of the trees we select to plant. Aussie Tree Care also completed tree removals of three pencil pines on a nearby street. These pines began to deteriorate in the small area they were planted in beside buildings. The largest pencil pine had grown above the adjacent three-storey villa, surrounded by concrete! 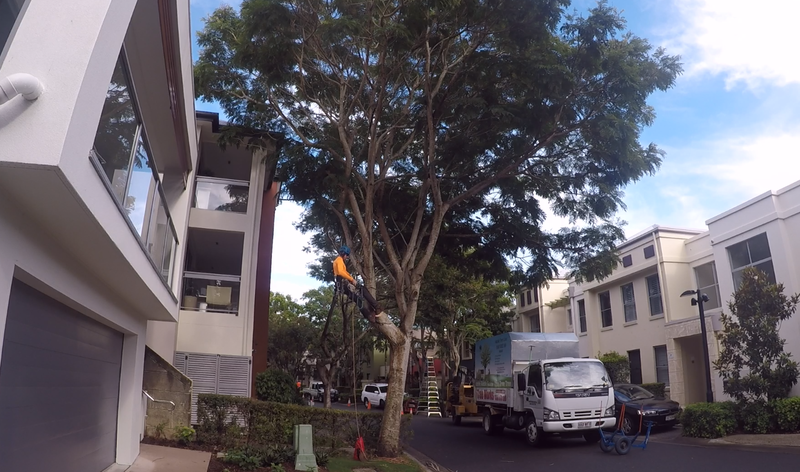 These three tree removals were completed quickly by our qualified arborists. After the ropes were set and the directional cut precisely ready, the pines were quickly pulled onto the ground. Our 14 inch chipper ripped the unwanted pines quickly into mulch, which we then delivered to another location on site to be recycled by the gardeners of Emerald Lakes. 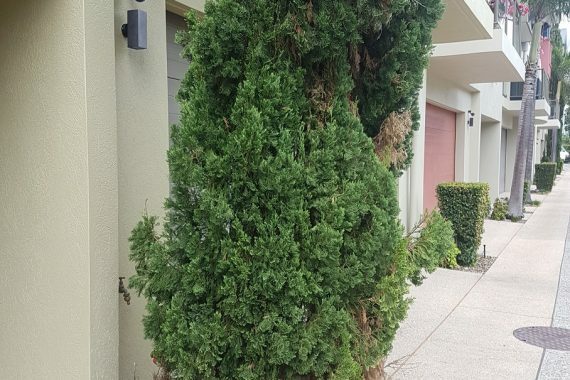 Our labourers cleaned up the streets, and the homeowners were able to once again enjoy their beautiful streetscape complete with a facelift by Aussie Tree Care. 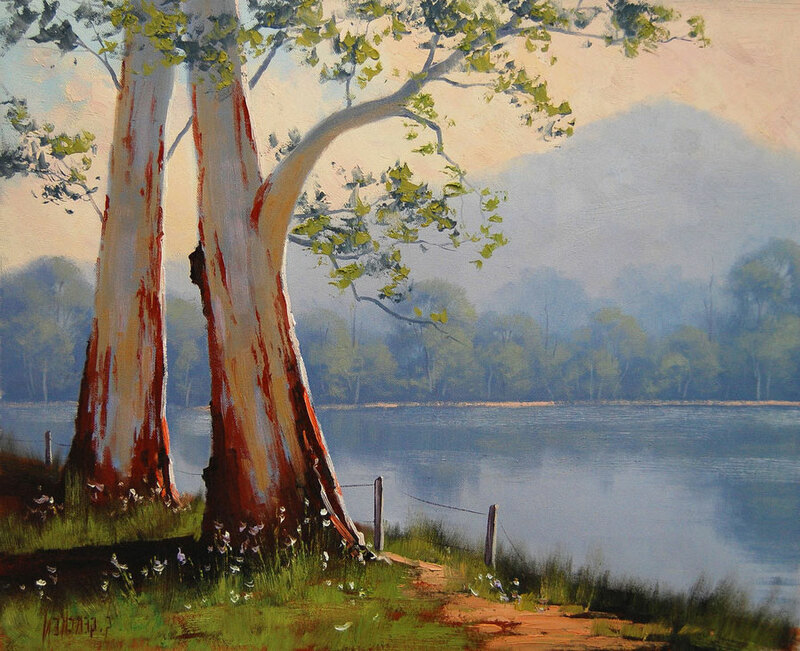 If you are looking for Gold Coast Arborists to help you with your trees, Contact Us on 1300873300. Grevillea Robusta (Silky Oak) is the largest tree species under the genus Grevillea within the remarkably trim family Proteaceae. Sometimes named Silky Oak or Southern Silky Oak, the plainly distinct tree isn’t even remotely related to the ubiquitous oaks we all know. The deceptively titled plant is indigenous to eastern parts of coastal Australia, primarily thriving in riverine climes of the far-flung country. The ideal surrounds for the species natural growth and optimal flourishing lies somewhere between rain-forest environments and subtropical overgrowths that receive at least 1,000 mm of rainfall annually. The principally evergreen tree grows incredibly faster than most other widespread staples cultivated by Australian arborists. It’s distinguished foliage resembles fern fronds and assumed a bipinnatifid representation. A mature Silky Oak grows to an average height of between 59 to 115 ft. Marked as the leading plants within the Grevillea genus in terms of trunk diameter, their ideal girth winds an estimated 3 ft. The fur-like leaves stretch to a typical length of about 6 to 12 inches. The leaves can always be dependably differentiated from other similar-looking foliage shapes on the basis on their rust-coated/slightly whitened undersides. 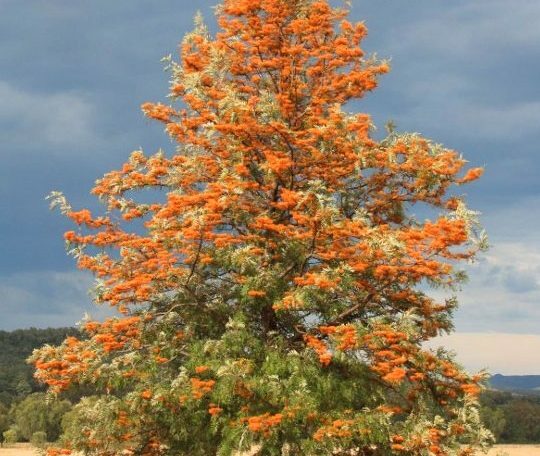 Whenever at its blooming peak, Grevillea Robusta flowers attain a tellingly outstanding golden-orange tinge, formed in bottle-brush shaped clusters that one can conspicuously espy from afar. These naturally enticing blooms are variously utilised for versatile purposes. Most importantly, the alluring wild bouquets are a vital source of nectar to which hordes of industrious bees massively flock to throughout spring. 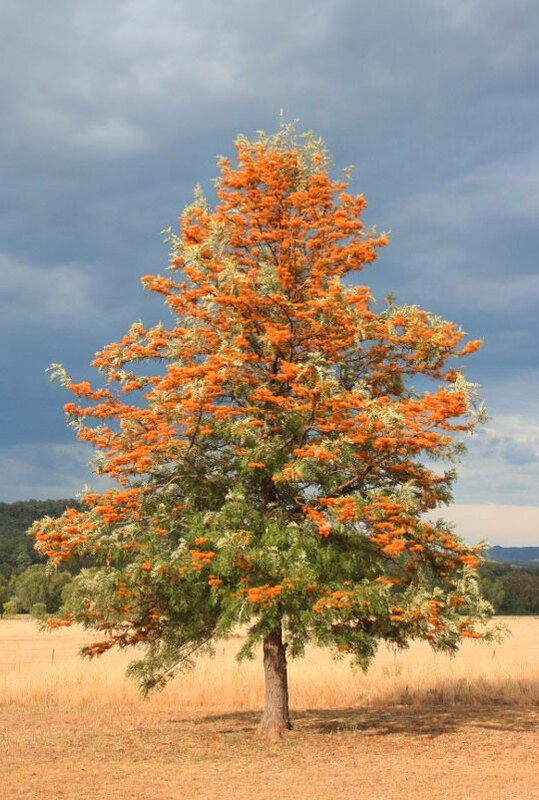 Nonetheless, those a little familiar with the outlook of this genus have already discovered that Silky Oak flowers feature a stark absence of petals. In the place of a beautiful petal, the bloom consists of an unbeatably longer calyx that breaks into four separate lobes. The tree’s seeds ripen sometime between late winter and early spring. Fruition takes place on skin-resembling dehiscent follicles, measuring about 2 centimetres and flat-winged seeds that appear rather dark-greyish in colour. A few centuries ago, Grevillea Robusta timber gave way to the use of aluminium in external window joints as a galvanising agent that toughened wood against possible decay. Even today, some modern carpenters occasionally put Silky Oak wood pieces to this majorly dated purpose due to a number of uniquely varying reasons. While this auspicious tree produces excellent timber, for crafting furniture such as cabinets, felling remains outlawed so as to preserve the worryingly dwindling natural reserves nationally. Owing to its unmatched aesthetic and tonal attributes, the species has been used to fashion top-tier guitars in the country and even beyond. Finally, Silky Oaks may be successfully grown as house plants under limited sunlight. Regardless of this fact, it ought to be noted that the genus does better when cultivated in areas that receive unlimited amounts of sunlight. As a worthy precautionary tip, growers and experimenting arborists shouldn’t overlook the danger the plant’s foliage presents. These narrow and longish leaves contain fatal amounts of hydrogen cyanide. Also, be keen not to overlook the dire warning that the enigmatic species also features doubly harmful tridecylresorcinol percentages – universally blamed for numerous epidermal complications such as contact dermatitis. 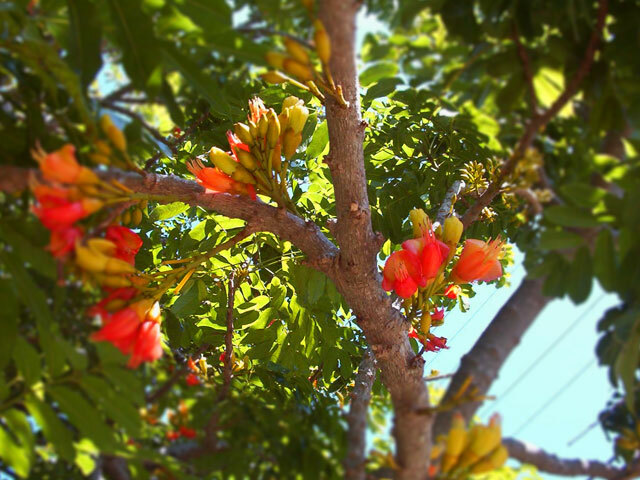 Black Bean Tree, also commonly referred to as Castanospermum Australe, is a flowering plant that uniquely stands out as the only species under the narrow Castanospermum. A moderately rare variety that’s found in select locales such as Australia in Queensland, Papua New Guinea, and New South Wales, this cadre of trees are widely recognised for their adaptive capacity to amass iminosugars within their amazing foliage. 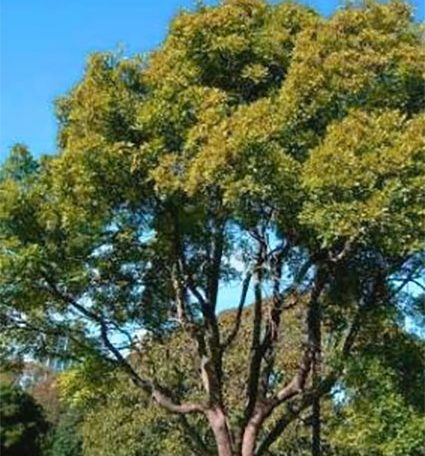 Sometimes known as Moreton Bay Chestnut, this chiefly hardy species is particularly suited for a varying range of climatic conditions throughout Australia. Like many other tree types out there, this rather lofty plant’s growth rates vary from one environment to another. 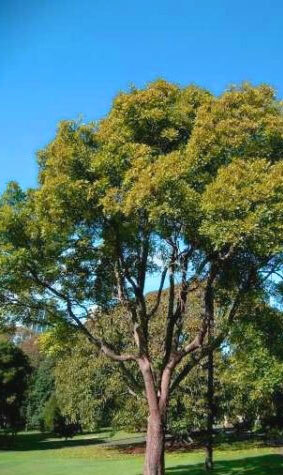 For example, Black Bean Tree grows to an estimated 8 meters in Melbourne. Even though the generally less demanding stems require uninterrupted sunlight right from germination to maturity, it doesn’t wholly disappoint even in surrounds without consistent light. If grown under rigorous cultivation, the tree ranges anywhere between 8 and 20 meters, depending on a host of more detailed factors. Under the aforestated environments, the variety normally assumes a rounded canopy span measuring up to 8 meters. As such, this excellent growth tendencies render the species an inimitable choice for natural park shades, one of the most exquisite garden vegetation options, and also an awesome pick for nurturing in resorts or such other recreational grounds. By the same token, Moreton Bay Chestnut makes for a perfect species for consolidating river banks against likely erosion given the fact that it has an extensively webbed root system. All the same, the same may not be somewhat ideal for largely rocky embankments since proper root spread might truncate it’s very basic natural growth and even it’s core viability as a soil consolidating plant. 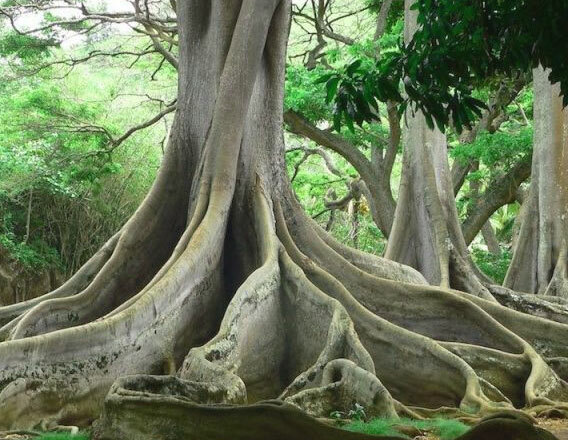 Regardless of the foregoing caveat, you ought to emphatically note that the tree can yet penetrate fairly stone-filled soils that other roots types will doubtless find somehow impermeable. Despite the plant’s seeds being quite safe for human consumption once refined meticulously, they have been discovered to be outright lethal to domestic animals. Because the lengthy preparatory process for these seeds shouldn’t be carelessly due to the high risks of self-poisoning, some wary Australian natives chose to shun them as food. In order to remove all the venomous traces, the seeds should be painstakingly roasted, sliced into fine bits, leached with running severally and for many days, and finally be pounded into flour. Additionally, Castanospermum Australe is a treasured source of walnut-like hardwood timber. In fact, it’s timber ranks among the most hard-wearing categories obtained locally. The leaves, just like the animal-endangering seeds, are highly perilous to livestock and pets as well. By the same token, the variety’s peculiarly wide-reaching root system makes it a poor choice for soils close to drainage piping, swimming facilities, sewerage lines, or fairly deep-going house foundations. Arborists usually start growing Moreton Bay Chestnut right from seed germination. Transfer from nursery to the main field should be carried out after the shoots develop the first pair of true leaves. The tenderlings also ought to be cultivated on a loose soil and watered sparing as over-watering is a sure recipe for fungal tooth rot. Mulching isn’t bad, although it shouldn’t be recklessly undertaken. Finally, liquid NPK fertilisers may be added, but not earlier than 3 months after germination. Gold Coast Australia walk ways are beautiful and shady, thanks to tree species like the Australian Teak. Scientifically called Flindersia Australis, the Australian Teak is a tall semi-deciduous tree with a scary brown bark and a dense crown. It belongs to the family Rutaceae. Other names used to refer to the tree are Crow Ash, Flinders Ash, Flindosy, or nut wood. Just like other species in this genus, Flindersia Australis is named after the explorer, Matthew Flinders. The tree grows fast in humid subtropical to tropical climates. In fact, it’s one of the fastest growing teaks here in Australia and other parts of the world. 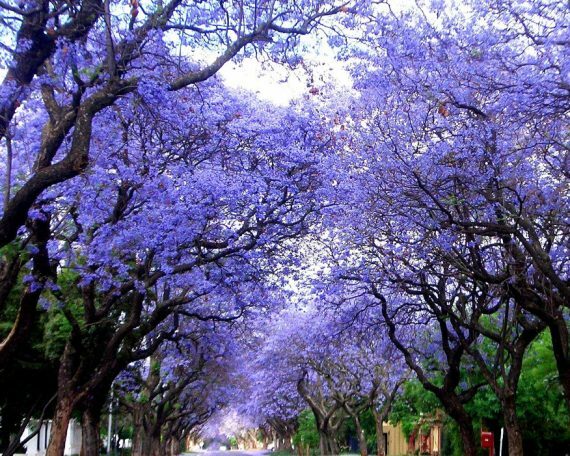 It grows to a height of 30 to 40m and a diameter of about 4 metres. The crown is made up of large, compound leaves with 7 to 15 lanceolate serrated leaflets. Such a crown makes a good shade. Flowers are small and creamy white in colour. They are stacked in a number good enough for a great display. The tree has a 5-segmented fruit that contains attractive winged seeds. With these characteristics, the Australian Teak is beautiful as a street tree as well as when planted in parks. – Crow ash is a Nitrogen fixing plant. It fertilises the soil and prevents soil erosion. – Due to its dense crown, it acts as a good windbreaker when planted on peripheries. – Multicrops such as Beetle leaf and Pepper find the tree a perfect crop to creep on. – The Australian Teak is well known for industrial and commercial purposes. Most popular uses include making furniture and cabinets and for particle board manufacturing. – The timber is also used for flooring and boat building. There are many factors that affect the success of planting programs for Crow ash. These factors include site, seed quality and seed supply, and management. Site is the most significant factor of these factors. So, what are the characteristics of the best site to grow the Australia Teak? 1. Rainfall and moisture requirements: Most Flinders Ash plantations in Australia are found in the humid rainforests of the east coast. Under the very moist conditions in the area, the tree grows large and fluted, behaving like a semi-arid evergreen species. However, the wood quality is poor in density, texture and colour. Teak grown in areas with lower rainfall (between 1,200 and 2,500 mm) provides timber of a higher quality. Under very dry conditions, the Australian teak is stunted and shrubby. 2. Light: Crow Ash requires high light intensity for optimum growth and development. Study results have shown that light intensity has a significant effect on the dry matter of seedlings. According to a 1974 study, it was found out that dry matter production decreases sharply as light intensity decreases. 3. Soil: Deep, well-drained alluvial soils are the best soils for the growth of the Australian Teak. The tree performs well in soils derived from schist, limestone, gneiss, shale and a selection of volcanic rocks including basalt. Worst performance is recorded on shallow soil, acidic soils, dry sandy soils, or waterlogged soils. 4. Temperature levels: Flinders Ash performs best under warm conditions (around 27-36 Celsius) which is normal here in Gold Coast Australia as well as within other sub-tropical climates. The tree poorly tolerates very cold conditions such as frost during winter. During such times, the seedlings and saplings get severely damaged and most of them die. It is common for people to think of palms as fenny looking tropical shrubs with sharp spines. Perhaps it’s common to see people grow palms here and there especially for their foliage and general fresh nature that it brings along with. Having palms is thus both a good thing but could represent a few dangers here and there is not carefully approached. You don’t want to go around blundering into a palm filled field as there thorny nature is not very welcoming. 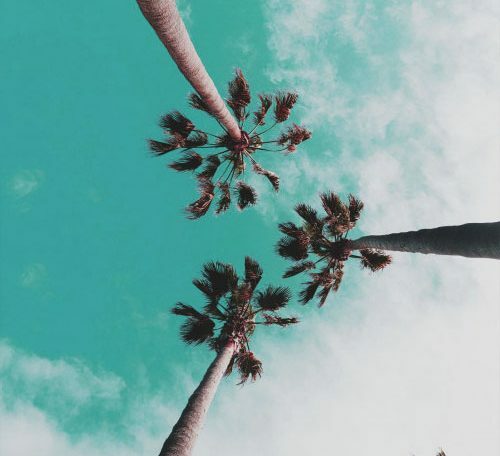 In this article, you will get to learn a few things about palm trees in Australia. Well, a most common type of palm tree in Australia is the Roystonea regia or rather Cuban royal palm that is found in most parts of Brisbane, Australia. Many people find it to be beautiful and very attractive to have in parks and even compounds. It is one of the tall palm tree types that you would just love walking through on a windy day. Having originated from the subtropical parts of Cuba, this palm tree is widely found all over the world. You will find it on many coastlines, but is equally grown deeper in the country. A common practice done on the tall varieties of palms is pruning. Pruning is ideally done to maintain and enhance proper growth. As with most plants, cutting of branches ensures that the trunks grow to full heights. The branches are thus cut down at different levels to avoid depriving it of food or even killing it. As will may arborists agree, palm tree pruning isn’t an easy task especially on species such as Zombia antillarum or Acrocomia aculeata that have spiny trunks and leaves all over. Additionally, incorrect pruning can also lead to death of the tree. You don’t want to cut of the buds as it kills off the tree or leads to stunted growth. Well, as widely seen in this article, the scary thing about most palm species is there thorny leaves and trunks that make it very dangerous to work around. This is that case especially with the low or short trunk species that form bushes all over. Some grow spiny leaves at a young age to protect them from herbivores all over. While some species lose the spiny nature on growing up, other retain it making them difficult to climb on even in their adulthood. You have to also be careful when spending time under tall palm species as old branches can hit your head when they fall off. Their fruits can also cause injury if you are not careful when walking around such as coconuts. 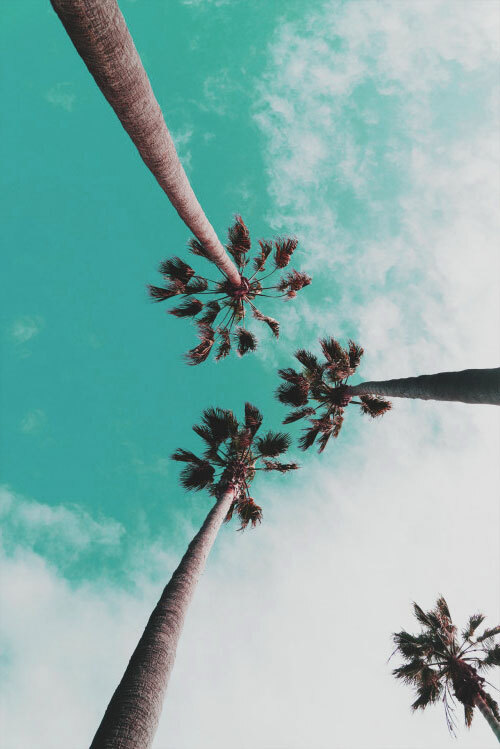 Finally, the best part of palm trees is that they have lots of benefits that make people to grow them in many parts of the world. The spiny nature can be dangerous, but make them good for hedges and fences for the people who love beautiful compounds. Some fruits offered by certain species such as coconuts have made oil among other food products that are loved by scores around the world. It is generally just ice to have the palm trees in the environment.